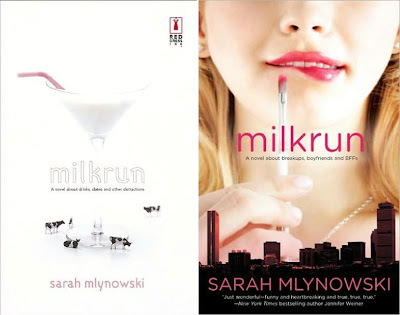 So I was browsing around Borders last night like I normally do and I noticed that Sarah Mlynowski's titles Milkrun and Fishbowl have been released with new covers. The price of these new editions is $9.99 instead of $12.95. The original versions were put out by Red Dress Ink and the new editions by Mira, which are both under the Harlequin umbrella. I wonder if any of her other adult titles will receive makeovers, I think Monkey Business is a great contender! I've been familiar with the original covers for several years now so it's hard for me to instantly decide between the two I definitely do like the new ones though! I've read articles in the past about repositioning books with their covers upon paperback release to capture a new audience, I'll have to dig some up and see what you guys thing. What's your favorite the old set or the new set? To be honest, I think I like the old set. Yeah, ditto. Old set is funnier too. Alea, you can always count on me to go in the opposite direction as the others...lol! I like the second one on both. If I was buying on cover alone, I would have never picked up the very first book with the milk. I like the old set better. But I like the new prices better too! Heyyy I've read those. I like the old set better as well, actually. Yargh, it's the half-headed woman syndrome! I definitely like the first covers better. I HATE when they do this - because I see the cover and think "yeah, new chick lit" only to discover that I have already read it (thank goodness I don't discover this after I have paid for the book). There is precious little new chick lit out there - its cruel to put up my hopes only to dash them! bermudaonion- They are sort of whimsical aren't they! veens- I know, they are all nice! J. Kaye- Yeah I like them all, the new Milkrun cover totally looks like Kirsten Dunst to me! amee- Yeah it's always funny when they change the prices! I got my copies for like a buck! keri mikulski- Yeah when I saw them in the store I was like what..... oh! Yeah the old set definitely stands out. I do wonder how they decided to do Milkrun, Fishbowl, and Monkey Business in one style and Me vs. Me in a totally different style. 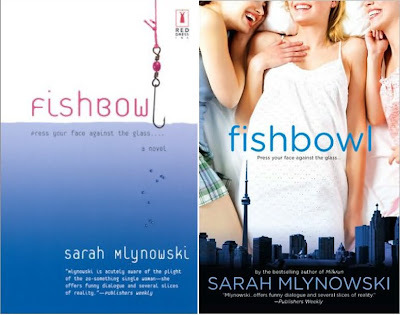 khyrinthia- I've only read Fishbowl! SHAME! fyrefly- Yeah what's with the half headed women! tina- Oh that would be bad! They do look totally different don't they! Hey, what are some of your favorite chick lit? I'm always up for some suggestions! I've never heard of these books, so I'm not attached to the old covers. I sort of like both sets. anna- Yeah I like them both too. I bought Fishbowl for a friend a few years ago for a gift and then ended up finding a copy for myself to read. I really liked it! The Blue Bloods Look Like The One With The Face On It!